Last Friday Hatsumi sensei made one of his usual puns speaking of “budô” and “mudô” and even if it was the title for my last post on this blog I forgot to explain its meaning. The kanji for “bu” (武) used for “budô” can also be pronounced “mu”. But “mu” (無) means “without, nothing, empty, emptiness”; like in Zen “mushin”, the no spirit no thinking attitude. So when sensei said “budô is mudô” he said that “the path of budô was the path of no path”. This new pun playing with the sound emphasized once again the importance of listening to what he is actually saying in his teaching and understanding our budô from a much deeper perspective. Budô being the path of no-path the bujinkan budô is the path itself and it cannot be expressed in words. The bujinkan arts beyond the mechanical aspect of the waza is simply a kankaku (感覚), a feeling. Training here at the hombu with Sôke is the only way to become able to “read between the lines” as he is pushing us to do regularly. The shidôshi not travelling to Japan to get their knowledge directly at the source, miss an extraordinary opportunity to develop themselves completely. Budô is more than a series of techniques, it is really a way of realization, a true art. At lunch time on Sunday, sensei repeated his intention to build a jinja (神社), a shrine for the bujinkan and he was not speaking of religion here but of creating a place where the practitioners would find a training place building their taijutsu as well as their “shinjutsu” written 心術 (and not 針術 – acupuncture). If we see budô as the science of growing flowers, we can see the difference existing between learning to plant a seed, caring it, feeding the germ and making the flower blooming; and the art of Ikebana (生花) where the art is to express life through a special flower arrangement based on the tenchijin. Moving from the physical world to the spiritual world is not the only possible through religions but also through budô. “Budô is mudô” then makes sense. Our budô is nature and nature is without intention. Being is the solution and attending the classes with sensei transforms us into true human beings. Nature is simplicity but a complex simplicity. This is exactly the same when you train here with sensei and the Japanese shihan. You watch their movements, you find them easy to reproduce and then you find yourself unable to reproduce them. This is the state of mind in which I was yesterday when training with Nagato sensei and Oguri sensei. One word to summarize that: “WYSINWG” (What You See Is Never What You Get. Their movements yesterday were based on very simple basic techniques such as: omote gyaku, ura gyaku, katamune dori, ô gyaku but the way the expressed them were beyond the mechanical realm. They were “holistic”! As I previously wrote it in my other entries on this blog, my words cannot express them correctly so this time I will not try to do so. Only if you were attending the classes can you have a slight chance of getting it. The classes in Japan are like the wind, you don’t see it but you see the movements of the leaves on the trees. Maybe this is why we say: “bufû ikkan”. This trip I am becoming aware, more than usual, of the unicity of their movement. 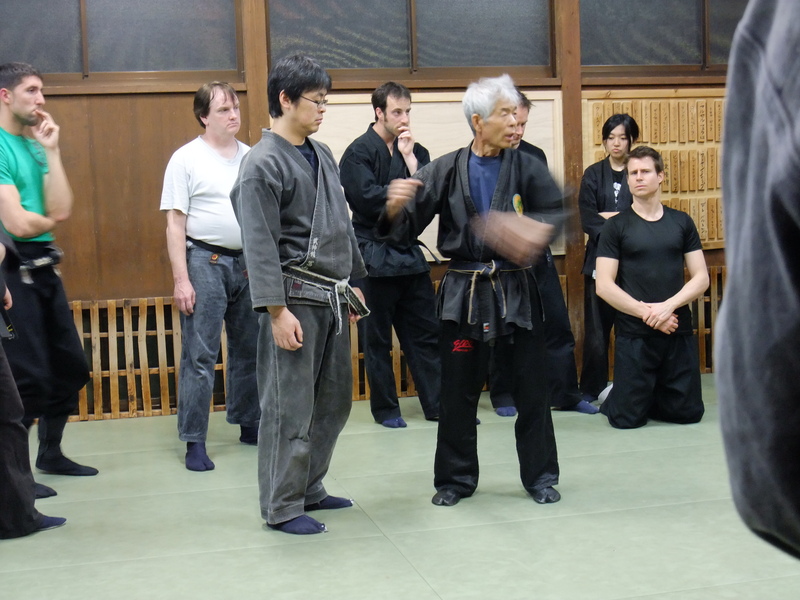 A way to express that could be: “bujinkan budô is unity in multiplicity”. Natural movement deals with everything at the same time: uke, tori, the terrain, the feelings, the angles, the bones, the intentions. In fact you must get the general image in order to move simply and efficiently. a book will never fight. So let’s study ikebana and plant the seeds of our taijutsu to get into the world of shinjutsu. An remember that the meaning of this year’s kihon happô speaks about a new germination, sprouting (happô – 八方). Surface complexity emerges from deep simplicity—Murray Gell-Man, Nobel Prize winning physicist. Seems like true masters converge around similar themes even though they come from wildly different starting points.